Spring has arrived in Northern Ontario and the snow has finally melted off the trails. The lingering winter season conditions in the Northeast provided excellent riding opportunities well into April this year, attracting riders from all over to come north. Unfortunately, in Northwestern Ontario the snowmobile clubs, volunteers and riders were challenged with an early heavy October snowstorm that created such a large downfall of debris that a large portion of the trails were unable to open this season. Snowmobile tourism in Northern Ontario has continued to grow and with new trail development projects such as the much anticipated official opening of a new trail loop in the Algoma Country region set to open in winter of 2019/20. ‘Boon-docking’ (back-country riding) has been immensely popular in the last couple of years with sledders looking to explore riding opportunities off-trail, especially around the Wawa region. Operators in the region have been targeting this new market with guiding and lodging opportunities. The Northeast Community Network’s World’s Best Snowmobile Destination initiative, based in the Hearst, Cochrane, Timmins, Temiskaming Shores region has been gaining traction over the last two years. The aim of this initiative is to enhance existing product, developing new product, and providing snowmobile tourists with a best-in-class experience, truly making it one of the world’s best snowmobile destination. Tourism Excellence North hosted a Moving Tourism in Your Community from Ideas to Action: Snowmobile Tourism Destination and Routes workshop in Cochrane May 8-9, 2018 to continue to build momentum for this project with 25 interested community stakeholders. This month TNO met up with Sean Mackey, who sits on TNO’s Snowmobile Tourism Product Development team to get his insight into all things snowmobiling in Northern Ontario. What is your involvement with snowmobile tourism in Northern Ontario? M&M Hospitality owns and operates four hotels in Temiskaming Shores. We are the largest contributor to the local snowmobile club the Tri-Town Sno Travellers, and the regional association as well (OFSC) District 14. I have sat on the Tri Town Sno Travellers Board for many years, the regional tourism board, Northeastern Ontario Tourism, as well as the OTMP Northern Committee. We have long been strong supporters of snowmobile tourism in the north. We realize first hand the effect it has on not only our business but to north as a whole. 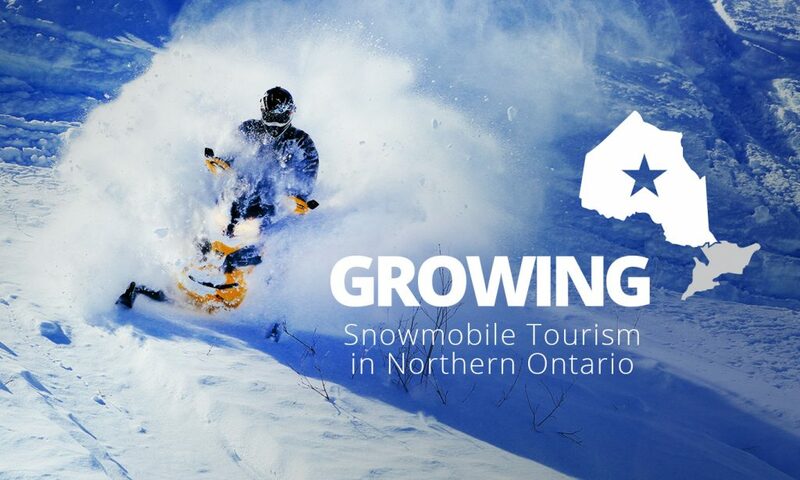 We have and continue to dedicate time and resources to ensure snowmobile tourism thrives in the north. What are some challenges that snowmobile tourism is facing in Northern Ontario? We are not alone with this challenge, but one of the biggest challenges would be mother nature. Weather patterns have changed over the last 20 years, and we continue to see warmer than average winters, less snowfall some years, and even unexpected melts during the middle of winter. Another challenge is the current OFSC model. This model does not necessarily work well for the north, as far as putting the best product we can offer to our consumers. Resources including capital for infrastructure needs to be allocated where it is needed the most which in general is Northern Ontario. What are the three exciting things everyone should know about snowmobiling in Northern Ontario? We offer the best snowmobiling experience in the world. Not only is the product (trails) second to none, but we have northern hospitality. The people of Northern Ontario, not only the businesses are what making snowmobiling a first class experience. Friendly people, great food, and unique experiences are all part of snowmobiling in the north. The variety of terrain is amazing. Riders get to experience groomed wide flat trails, rolling hills, farm fields, wide extensive power lines, breathtaking boreal forests, lakes, rivers and the list goes on. Around every turn the beauty of Northern Ontario captures the riders, and makes for an experience that is world class. We are family friendly in Northern Ontario. Our trails are wider, not as congested as they are in Southern Ontario, making it a great place for young riders to experience all that the sport has to offer. Another big bonus is that in every town or city, we have many activities or attractions families can take part if they decide to take a day off from the trails. Where do you see snowmobile tourism in Northern Ontario in 5-10 years? Truly known as the World’s #1 Snowmobiling Destination. Snowmobiling in Northern Ontario will become a bucket list item for many people!